Well, here’s a Jacob Grimm you may not have heard : ) As a philologist studying Germanic folk customs, Grimm speculated that the custom of Easter eggs may have stemmed from springtime frolics in honor of Eostre—the Proto-Indo-European goddess of dawn. If so, it’s just one more in a longtime legacy of eggs and the ancients. 60,0000 year old decorated ostrich eggs have been found in Africa. Rituals connecting eggs and rebirth go back 5000 years or more in Egypt, Sumeria and Mesopotamia. And historians tell us Christians in the latter culture were the first to dye eggs ritualistically, coloring them red as a reminder of blood. Today, egg-decorating has launched into all sorts of glittery, fluorescent-hued territory—fun, though not particularly appetizing. The idea of eating chemically-dyed anything has always been a bit suspect. That, plus the appeal alchemy has on me prompted me to try my hand at using easily-found kitchen ingredients to naturally dye eggs. I’ve been so pleased with the results! Using coffee, onion skins, red cabbage, and a little vinegar I was able to produce a lovely array of hues: Blue from the cabbage, orange and red from the onion skins and warm beiges and taupes from the coffee. 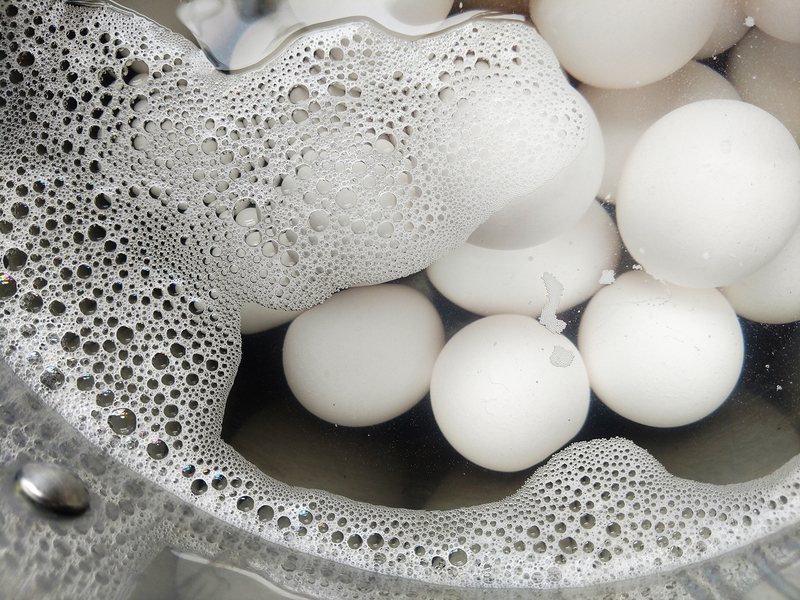 For best results: Wash the uncooked eggs in their shells in soapy water and rinse before dye-ing. To color the eggs, I used two different methods: 1. Simmering the eggs in hot dye for more intense color, and, 2. Soaking the eggs in cold dye for less-intense color. With the red cabbage dye, I did a little of both: I prepared the dye, simmered the eggs briefly in the hot dye and then allowed the eggs to soak in the dye as it cooled. Note: You can safely eat the hard cooked eggs after dye-ing them, but the whites of the eggs may absorb some of the color of the dye. Also important? Do NOT eat any eggs that have been out of the refrigerator for more than two hours. Method: Peel the skins from the onions. Reserve and refrigerate the onions for another use. Place the skins in a three-quart heavy gauge pot over medium heat. Add 2 quarts of water and ¼ cup white vinegar. Heat the water to boiling. Reduce heat to a simmer. Simmer for ½ hour. Strain to separate skins from dye. Discard skins. To dye eggs: Method one (For intense red-orange): Wash eggs in soapy water. Rinse. 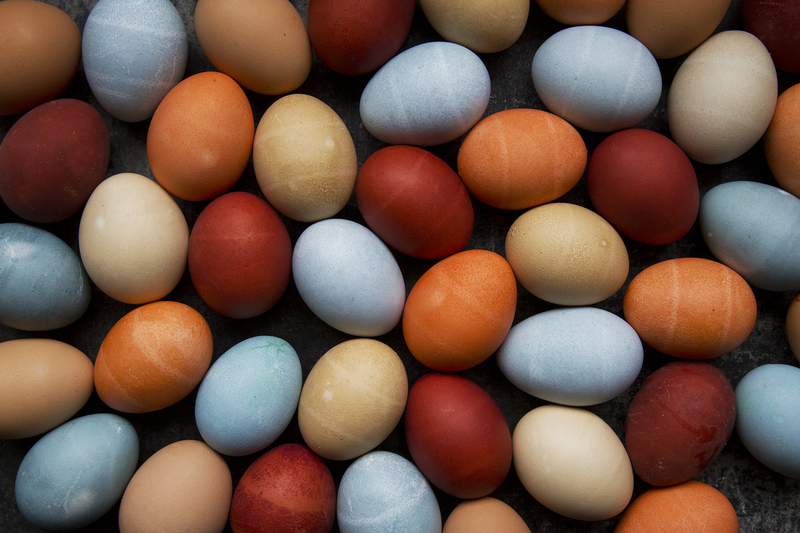 Immerse uncooked eggs (in their shells) in hot dye and simmer for 25 minutes. Remove eggs from dye. Cool. Refrigerate eggs. Method two (for bright orange): Immerse hard-cooked eggs (in their shells) in cool dye for 5 to 10 minutes. Method: Place chopped cabbage in three-quart heavy gauge pot over medium heat. Add 2 quarts of water and ¼ cup white vinegar. Heat water to boiling. Reduce heat to simmer. Simmer for ½ hour. Strain out and discard cabbage. To dye eggs: Method one (for more intense blue): Wash eggs in soapy water. Rinse. Immerse uncooked eggs in hot dye and simmer for 25 minutes. 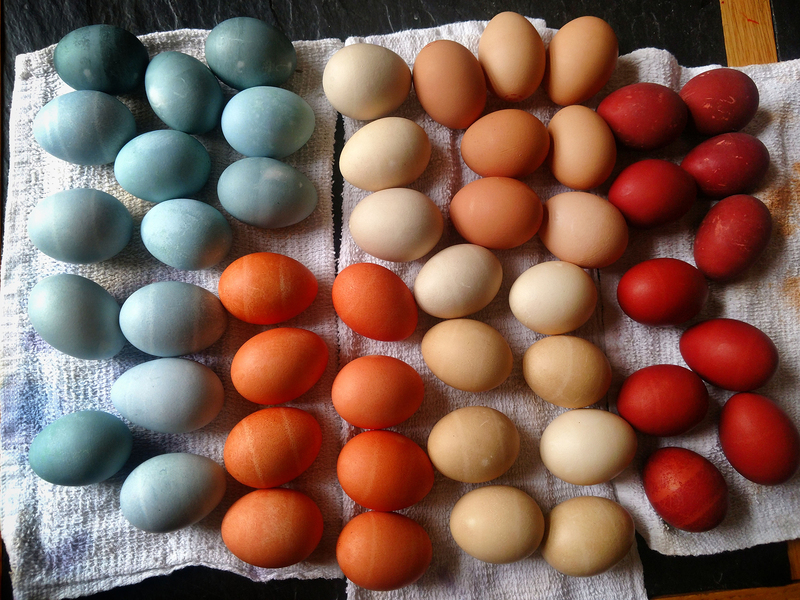 Allow eggs to cool in dye until the desired blue is achieved. Refrigerate eggs. Method two: Immerse hard-cooked eggs (in their shells) in cool dye for 10 to 20 minutes. Refrigerate eggs. Method: Wash eggs in soapy water. Rinse. Immerse hard-cooked eggs (in their shells) in cool dye for 10 minutes to an hour until desired beige/taupe/brown is achieved. Refrigerate eggs.